Hensbarrow Beacon and Carnmenellis had been the only two hills I had planned to activate during our week away along with Kit Hill on the way home. However, my Wife suggested whilst driving back to our cottage early from a trip to Truro that I should ‘do’ a hill that afternoon whilst she has a wee sleep. The obvious hill had to be Watch Croft because of its location being the most westerly English summit it would be a long way to come in the future to activate. A quick check of the satnav suggested it was about a 45 minute drive allow 20 minutes to walk to the summit and 40 minutes activating this would give my wife 2.5 hours rest – perfect. So it was off down the A30 to Penzance before cutting off towards the north coast and the parking place at SW 418 343. 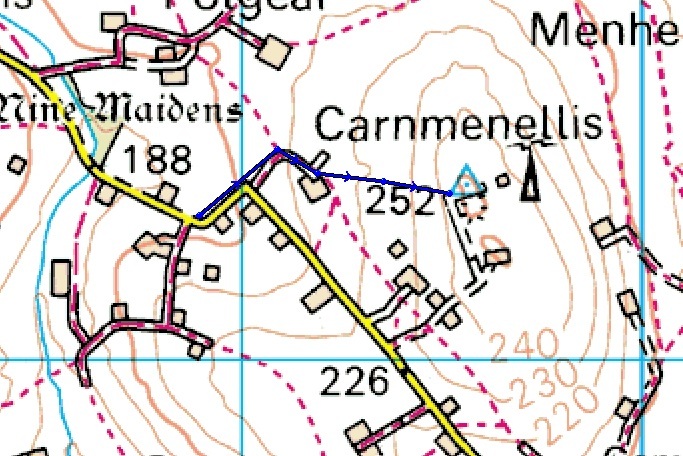 Taking the track opposite the parking place lead up to a cottage at which point I turned right along a narrow but obvious track to the summit cairn. Distance walked 0.77 miles ascent 185 feet. FT-817 5 Watts plus 2Ah SLAB, linked dipole 60m, 40m & 20m and palm paddle keyer. Using the trig to secure the mast I set up and self spotted for 40m SSB this lead to 8 QSO’s with EA1DFP, G0RQL, ON6ZQ, MM3PDM, EA2CKX, EA2DT, G6TUH & M0WBG. Once the pile-up ended I became very aware that I was being watched, looking up from my radio I saw two gents sat across from me with a completely puzzled look on their faces. We spent the next 15 minutes engaged in a conversation about radios and hill waking especially about the places we mutually walked around the world. A pleasant end to a warm pleasant day. 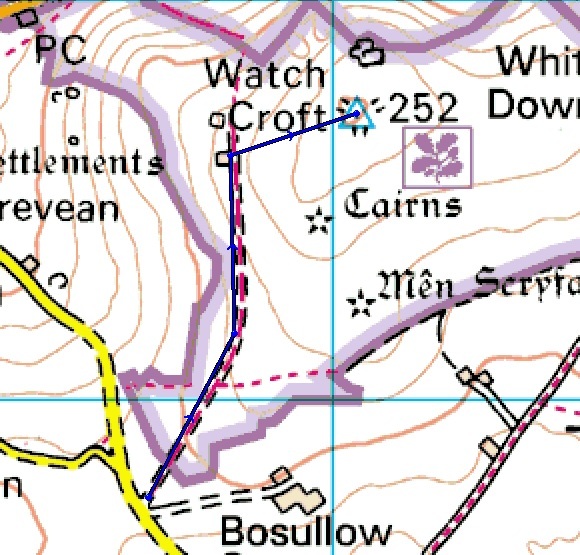 Before setting off to Cornwall I had downloaded a copy of the SOTA Satnav files along with the caveat that they had not been updated in a few years and so could well be out of date in some circumstance. Well this was certainly the case with Carnmenellis. In preparation of this activation I had read up on some of the previous activation reports to get an idea of where to park the car. So I knew in my mind what to expect when I got to the parking place – well the Satnav had other ideas by sending me to the east side of the hill rather than the west side. So after a little driving around I eventually found the site I was looking for. Parking at SW 688 363 I made my way up the track then across country through the bracken and gorse to the trig point. Distance walked 0.44 miles ascent 155 feet. 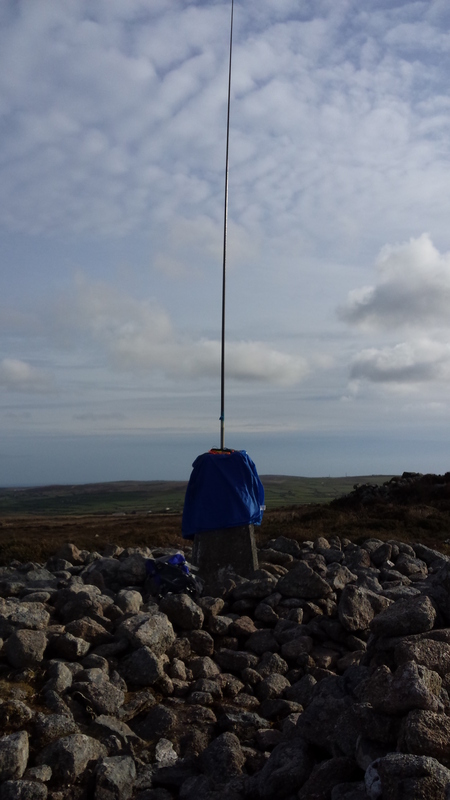 Setting up near the trig point I opened up on 40m CW with 5 QSO’s with G4SMN, G4FGJ, F6EAZ, M0IML & PA7ZEE. Switching to SSB secured a further 6 QSO’s with G6TUH, G4WSB, ON5SWA G0VWP, M0JLA & M3FEH before the band went very dead. Conditions didn’t seem as good today as they had been yesterday but they reflected the way the bands had been fir some time. Having got married on Friday 24 April 2015 me and my new wife headed off to Cornwall for a weeks holiday. 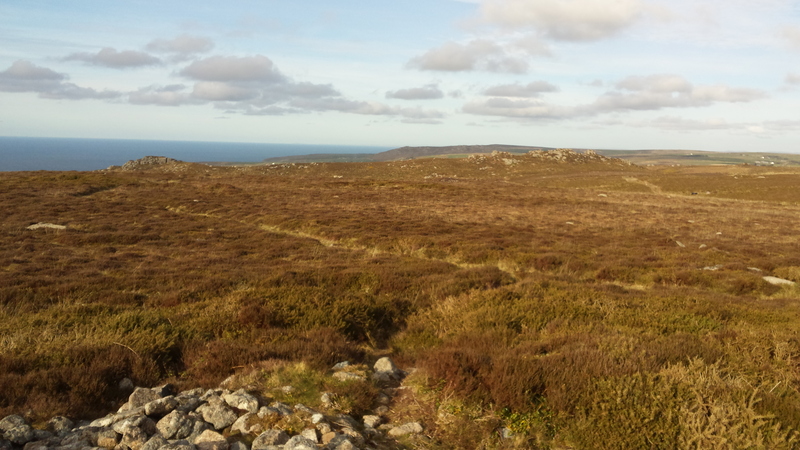 Basing ourselves near St Agnes in mid Cornwall we were ideally located to cover most of the county. Our plan was to have no plan just go out each day and see where we ended up. However, interspersed with our non-plan was the plan to activate a handful of hills whilst in Cornwall. The first of these was Hensbarrow Beacon G/DC-004. My wife suggested we take a picnic to consume during the activation and wondered why I laughed, she was later to realise why! 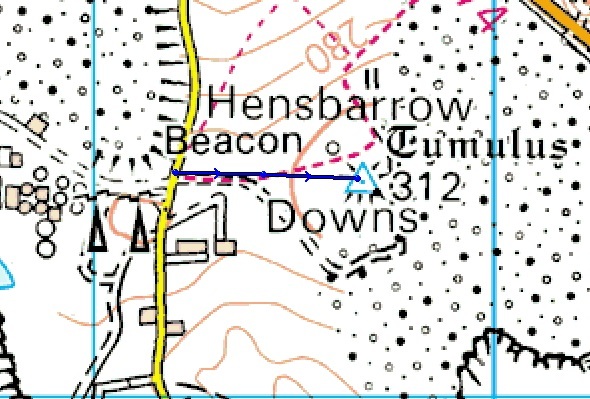 Hensbarrow Beacon is located in the heart of the Cornish China Clay industry and is surrounded by slag heaps that dwarf the ‘summit’. The air is full of dust and fumes from the constant stream of lorries moving around the vicinity. Certainly not the prettiest summit I have activated and certainly not the best place for a picnic! Distance walked 0.28 miles ascent 56 feet. 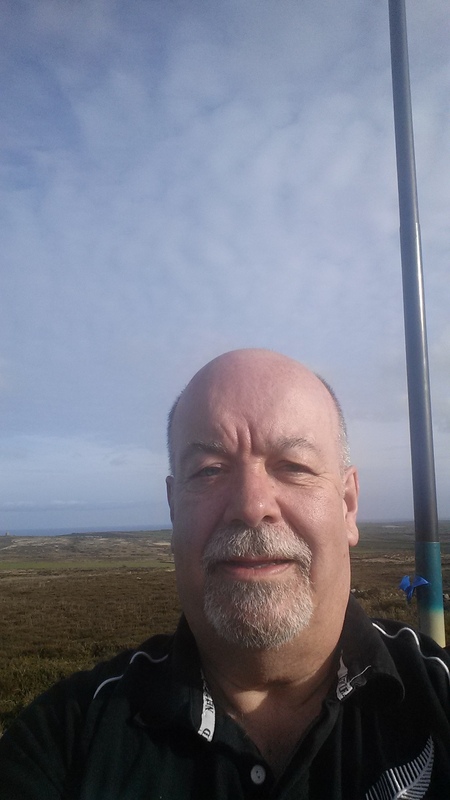 Setting up shop close to the trig point I started on 60m SSB but only managed 1 QSO so a switch to 40m CW brought in a string of 10 QSO’s in 5 DXCC’s. Changing to 40m SSB secured a further 13 QSOs before the calls dried up. So it was back to the car and off to somewhere well away from here to enjoy our picnic.